We can always count on graduate designers to push the industry's boundaries. As part of our review of the year, design editor Alice Morby picks the 10 best projects from the class of 2017. 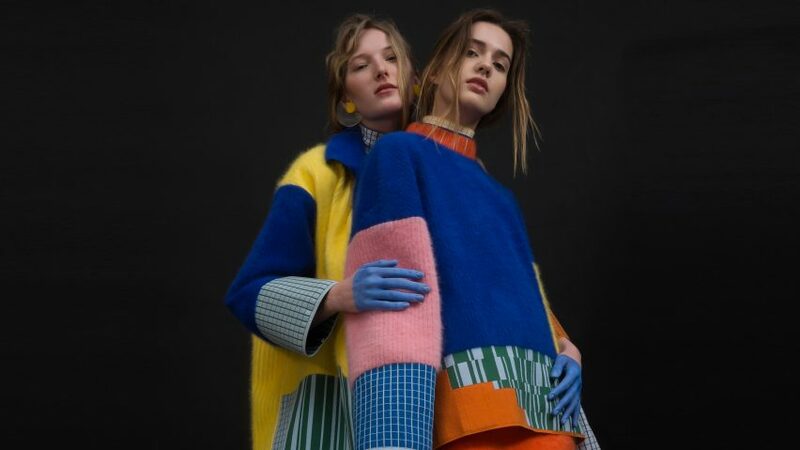 London College of Fashion graduate Chen Zhi hoped to celebrate the "superficial" reputation of the fashion industry through her colourful final collection. The works of Alexander Calder influenced the bright colours and blocky shapes seen across the knitwear pieces, which were later put on show as part of an exhibition at New York's MoMA. Ailsa Inglis came up with the idea for the Nixie Girl menstrual cup after her research revealed that 93 per cent of women who menstruate still use regular period products. She felt the best way to tackle the stigma surrounding alternative period products was to make them accessible for young people, and potentially encourage a lifetime of use. Ben Cullis-Watson designed this bin to convert food waste into compost for the garden, as well as liquid fertiliser for household plants. It relies on bokashi, a Japanese method that uses fermentation to decompose rubbish, leaving no mess or smell behind. Taihi automatically sprays an accelerator mixture onto the waste to start the process, which takes around two weeks. A student of the Royal College of Art product design masters, Dani Clode wanted to challenge conventional ideas about prosthetics with her graduate project. This resulted in the Third Thumb – a motorised, controllable extra digit, designed for anyone who wants to extend their natural abilities. For her graduate fashion collection from Central Saint Martins, designer Johanna-Maria Parv looked at how clothing historically restricted women's movement, and then made alterations inspired by female cyclists. Garments featured precise tailoring which was gathered around metal components in between the thighs. Cycling accessories such as lip-shaped helmets and gloves were supersized. Kaye Toland, a graduate of Central Saint Martins' bachelor's course in Product Design, initiated the mCycle project as "her own personal response to tampon tax". Named mCycle, the company would work in a similar way to British online food delivery company Deliveroo. Tampons are couriered via bicycle in a cardboard package, which then transforms into a sanitary bin. Elena Larriba's Vycle is a pedal-powered, vertical transportation system that affixes on the side of buildings, scaffolding or cranes. This range of kids clothing by Ryan Mario Yasin is designed to expand as they grow – negating the need for parents to buy endless outfits. Yasin hopes that by creating kids' clothes that last longer, it will help reduce the huge amount of waste generated by the garment industry. When creating the collection, the designer used his background as an aeronautical engineer to devise a set of permanent folds that let clothes "unpack" when pulled. Aiming to offer partially sighted people greater independence, Emilios Farrington-Arnas created a range of wearable tech products that help them navigate from place to place. The set comprises a visual sensor that can be worn like a necklace, and a series of feedback units that can be clipped onto clothing, or worn around the wrist. The sensor connects to a voice-controlled iPhone app, so it can use GPS to direct the wearer. It does this through a series of vibrations to the left or right side of the body. Based on her own experiences in hospital, Alissa Rees developed an intravenous system that can be worn – giving patients more freedom to move around. The IV-Walk project forms part of Rees' ongoing projects aiming to "humanise the hospital", and is designed to be worn over the shoulders of the patient, with the drip encased in soft fabric.